I've been meaning to highlight this wine for quite some time. Now seems a fitting occasion, as it truly celebrates the spring that is finally upon us, fresh, exhuberant, lively! Light straw yellow in color with refreshing honeydew melon, tropical fruit and minerality on the nose, it has a smooth yet sassy mouth feel. Notes of peaches, quince, stone fruit and pear appear as well ... round and clean with a moment of sweetness, a little bit floral, great acidity, finishing ultimately dry and clean. A festive, delightful wine. Excellent value! Have a case on hand for drop-by guests in summer to enjoy on the patio, porch, picnic or beach! I love this! Generally around $8.99/btl! This wine is made from the white furmint grape mostly grown in the region of Tokaj, in northeast Hungary and often known for producing a sweeter wine. In fact, furmint is used to produce a range of wines, from bone dry to very sweet. 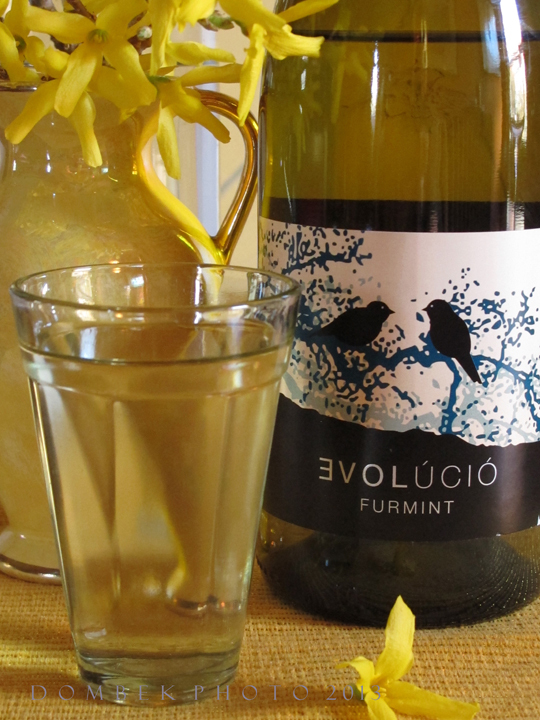 Evolúció is of course an example of dry furmint. Tokaji vineyards are located near the border of Slovakia and Ukraine, mostly planted on south facing slopes. The Bodrog and Tisza rivers are highly influential and create ideal ripening conditions for the furmint grapes. This is a continental climate with relatively high temperature variations. It was also in this region of Hungary, that in 1730 had the distinction of developing the classification system of wine on the basis of quality. This was several decades before Port and 120 years before Bordeaux! Grapes are hand-harvested from various vineyards in the region. Some terroir consists of volcanic stone and ash. Enjoy with white fish, chicken dishes or perhaps a plate of cheeses, especially goat cheese. Imported by Boutique Wine Collection, Philadelphia, PA and distributed here by Central Distributors, Lewiston, ME. Available at RSVP, Whole Foods, Old Port Wine Merchants and Miyake Restaurant - Portland; Pineland Farms Market - New Gloucester; Forage Market - Lewiston; Oak Hill Beverage - Scarborough and Downeast Wines in Kennebunkport. With a chill yet upon us and as we're yearning for spring, I for one am feeling in the mood for a nice RED to transport me from these cooler climes! This tempranillo from the region of Rioja in northern Spain fits the bill. This is brilliant, deep scarlet black in color, most regal. On the nose an earthy perfume of spicy wild fruit such as plum, cherry and blackberry, essence of violets along with stony earth and bark. Dark berries of huckleberry and tart blueberry follow on the palate with the subtlest of smoky char. Sensuous, silky mouth feel and balanced tannins are beautifully integrated. Deep fruit like fig comes alive with some time in the glass, while remaining fresh and exuding a touch of balsamic. Finish is dusty, even bright .. yet sleek and youthful. Complexity without heaviness. Delicious and affordable too at around $13/btl! Excellent value. Pair with rustics cheeses, meats, tapas and crusty breads or any straightforward, hearty dish. Awarded a Bronze medal by the International Wine Guide. The winery, Bodegas y viñedos Martínez Corta was established 50 years ago in Uruñuela, in the heart of Rioja Alta. 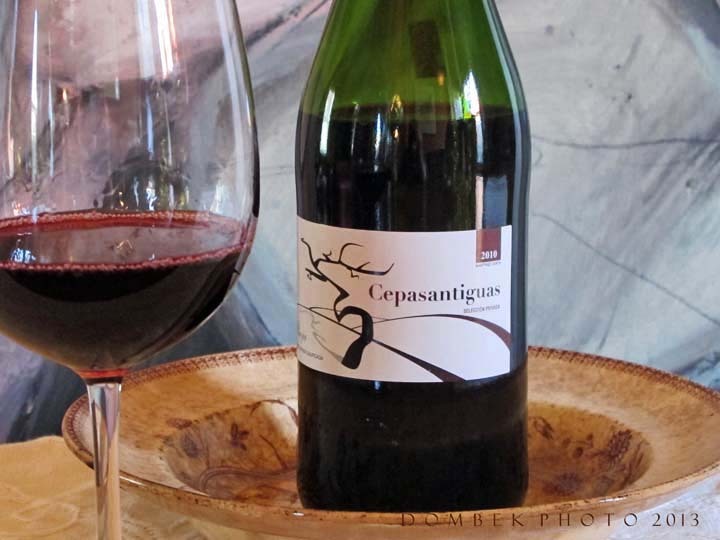 Rioja's reds are often thought of as "Spain's Bordeaux", although these wines additionally possess characteristics reminiscent of Burgundy (this is apparent with regard to a certain restraint and clarity I experienced with the Cepasantiguas). In the 60's and 70's, Grandfather and four sons were the major producers of wine in the Spanish village of Uruñuela. At that time there was no fancy machinery, only manual labor and simple machinery with the help mules was used. There has been modernization since that time with a state-of-the-art facility, however a hands-on approach is maintained. Terroir consists of stony soil, with little organic material. This does allow for excellent drainage and imparts an elegance and minerality to the wines, in this indigenous cool-climate viticulture. I could actually imagine drinking this one during any season at all! Available in Maine through SoPo Wine Co, at Browne Trading Co. RSVP and Rosemont Market, Portland; Oakhill Beverage in Scarborough. Importer is Classical Wines, Seattle, WA.